One little box of orzo pasta seems to have about 10 lives. Soup felt like a good idea to make in advance and to pack for lunch. 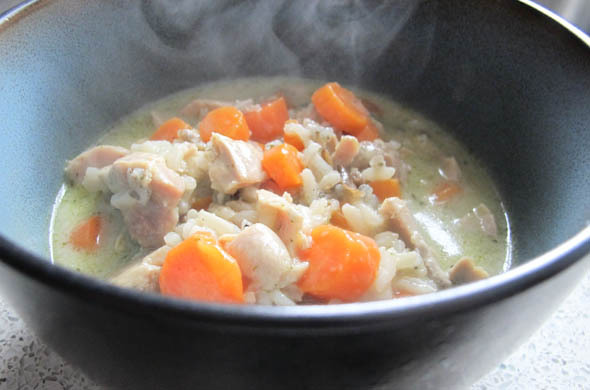 This one was ohh-so-amazing despite seeming ordinary so I might need to whip it up again. 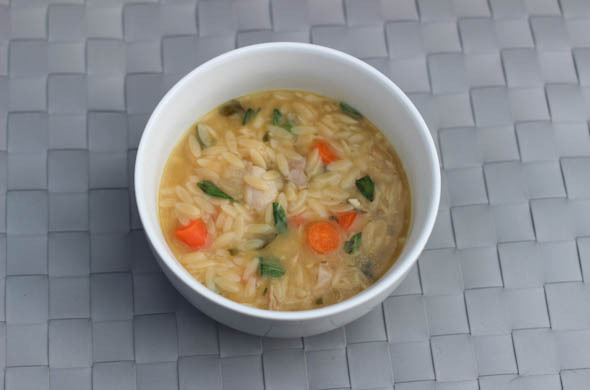 At first I thought about a small batch but then I added in the remainder of my box of orzo and kept adding broth to keep it soupy. I absolutely loved the lemon and found it really comforting. 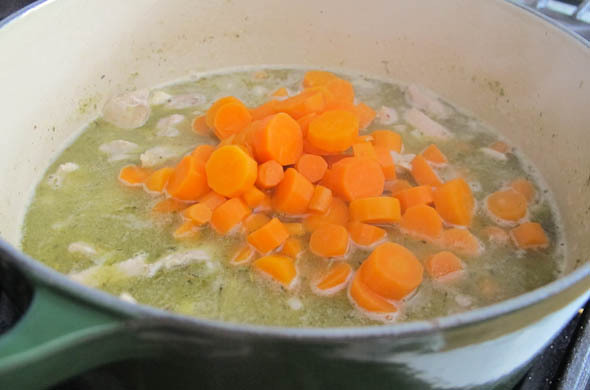 Place the chicken bones, chicken skin, the carrot ends, onion peal, and oregano sprigs into a large pot with 4-5 cups of water. Heat to medium high heat and cook for 15 minutes. 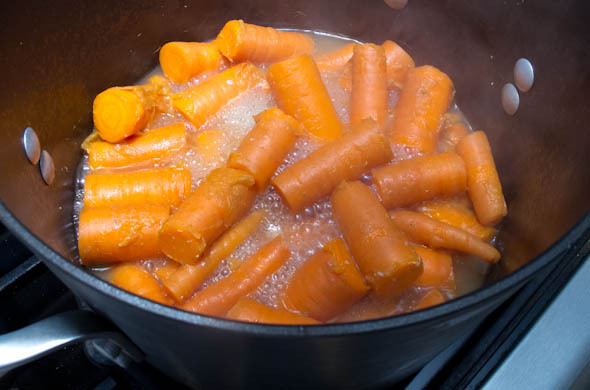 While making the broth (homemade broth is really good and so worth it), in a heavy pot saute the onion in olive oil for 10 minutes over medium heat, then add the carrots when the onion is getting clear. Strain the bones and veggie remains and put the chicken broth into the pot with the onions and carrots. Add in the chicken and juice from the lemon and cook for about 5 minutes. 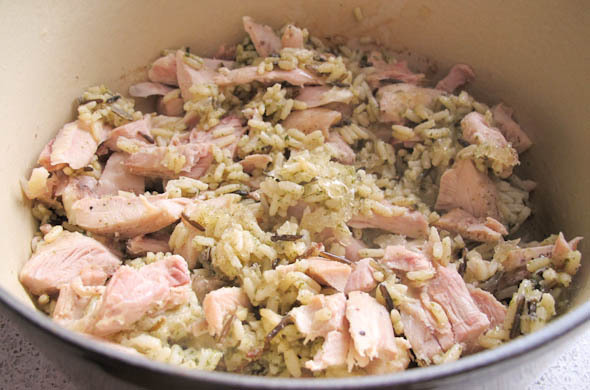 Pour the orzo into the pot and cover the pot to cook for 10 minutes. 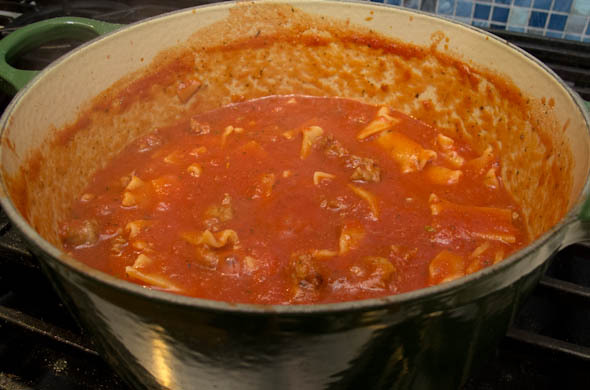 Add in the oregano, stir well, and enjoy! The lemon makessss this soup. It is so flavorful from the lemon and the oregano to instantly transport you to the Mediterranean. I made mine super thick so I added water just before heating come lunchtime at work. Baby carrots are a little bit funny but they’re so perfectly all the same size! It feels very Barefoot-Contessa to say “if you don’t make your own, pre-made broth is OK too”. 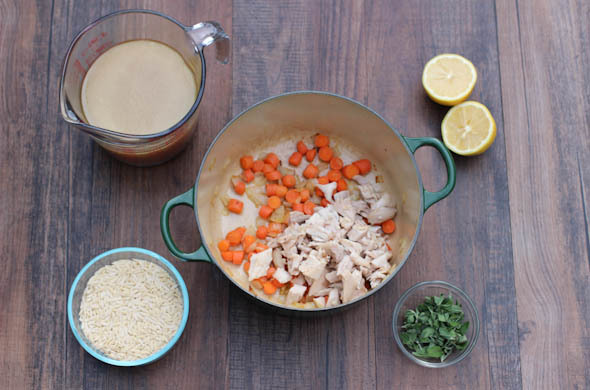 This is just an easy time to use a roasted chicken and make some broth with the bones, carrot tops, onion peal, and oregano sprigs. 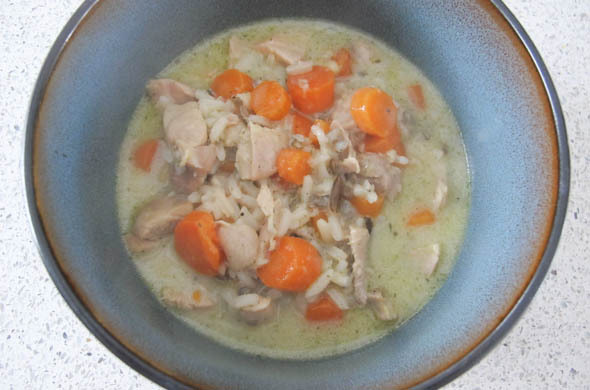 I froze some and it tasted great but some of the orzo broke down a bit in the freezing/defrosting/warming and stirring. I can deal with that though. 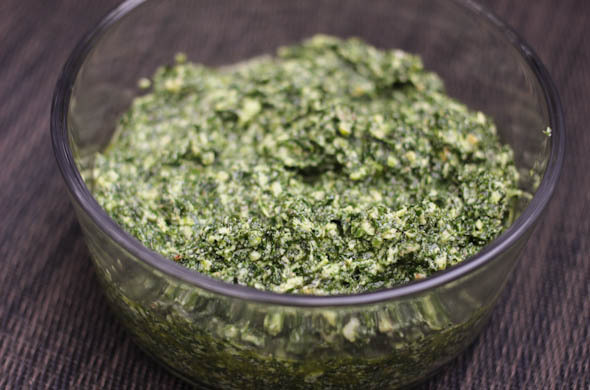 I made a big batch of kale pesto awhile ago and froze a few servings. 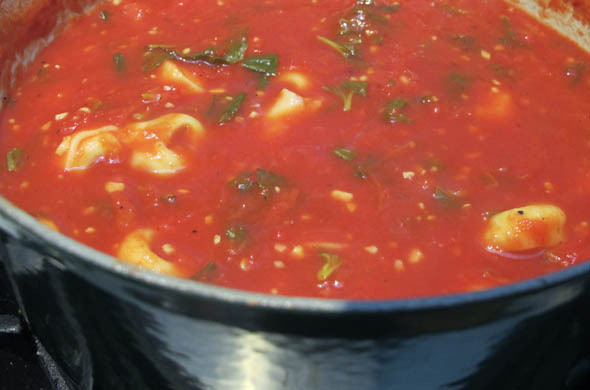 I was thinking about uses for this flavor-packed sauce other than on pasta. 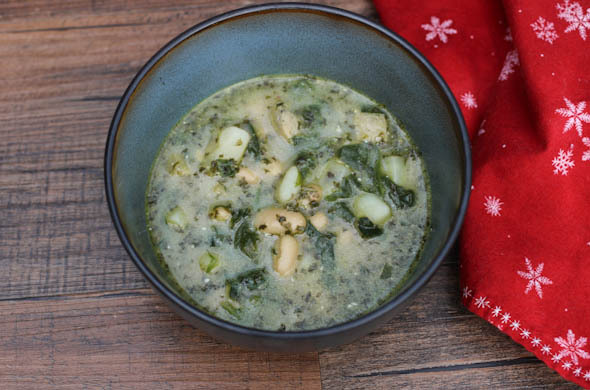 I added some to soup in place of the traditional chopped kale in soup with white bean and sausage. 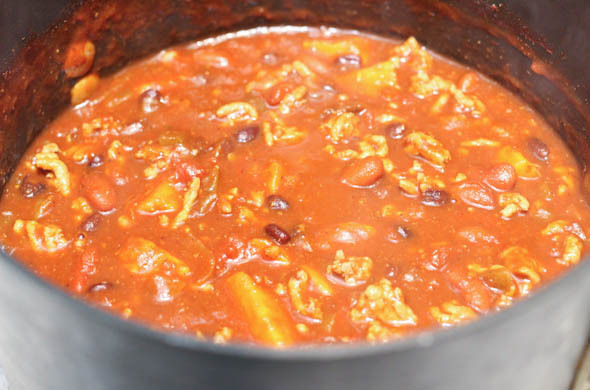 This soup is comforting, super flavorful, and such a balanced meal. 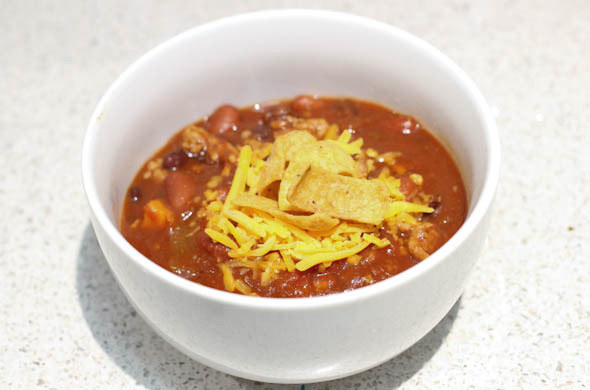 This was ideal for a lunch on a cool day and then I packed the other servings up to bring for lunch at work. This whole packing-lunch thing is tricky as I was out of the habit when I got lunch at work. 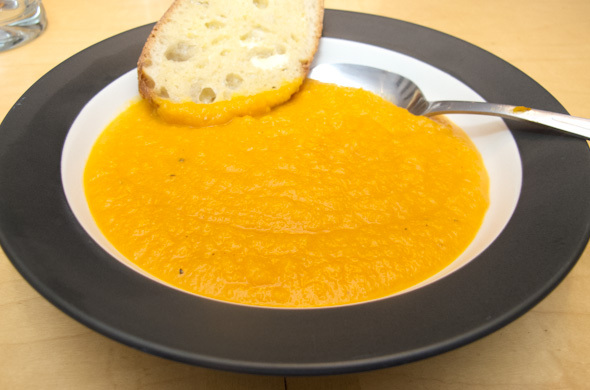 Soups have been good for lunch variety and I love that it doesn’t have to be made in a mass quantity. Heat broth in a large pot over low heat. Cook the potato. Chop the sausage and the spinach. Rinse the beans. Add everything to the broth and cook for 30 minutes. This had such amazing flavor from the pesto. 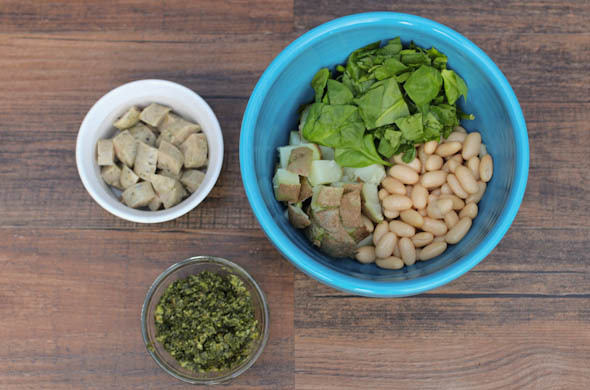 I used spinach as the greens in there for more mild flavor and texture but any other would work well too. I only had 1 sausage link so I upped the beans and potato. I have a cocktail-mocktail coming up next. Stay tuned! I’m back! I was just too crazy to blog during my busiest time at work. I’m proud to say it was a success and now I’m super ready to embrace the season! 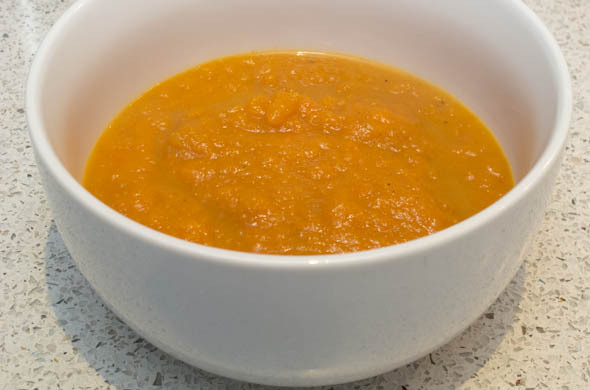 I made this Creamless Tomato Soup as a super quick lunch that I thought was especially nice after a filling holiday weekend. 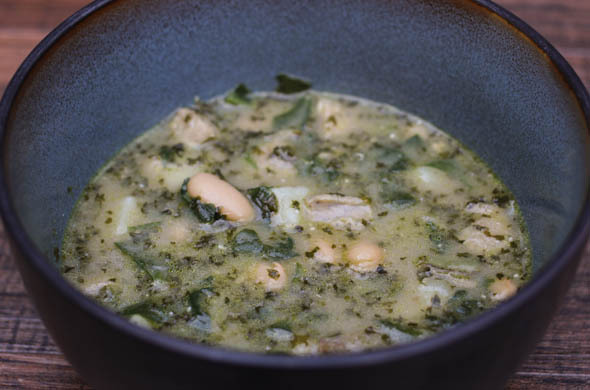 There isn’t any cream or bread to thicken this soup and the white beans add that element with the bonus of some protein. Now you just need a grilled cheese! Saute the garlic in a little olive oil in a heavy pot, over low heat for about 2-4 minutes. Add in the tomato paste, kitchen ready tomatoes, white beans, and salt and pepper. Cook over medium heat for 10 minutes. 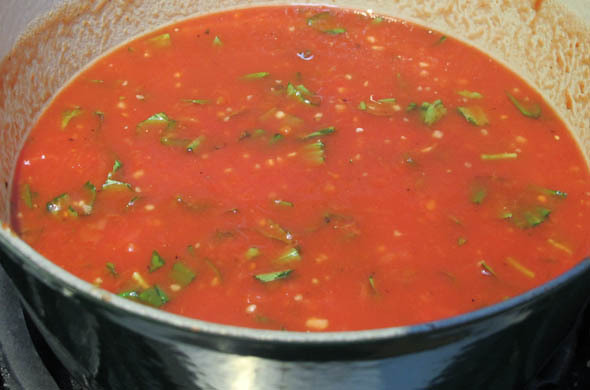 Blend either with an immersion blender, or carefully labeled into a blender or food processor. Return to the pot and add in the oregano. Cook for another 5 minutes on low. I think the herbs make this soup. I was feelin’ lasagna but wanted to speed it up and not have to bake it forever. 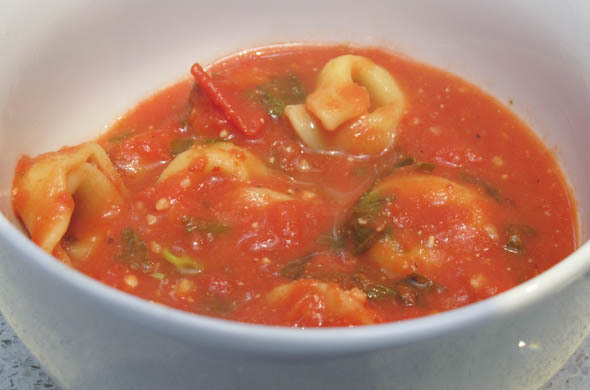 This soup was quick and hit all the flavors I wanted! I went a tiny bit heavy handed with the red wine, so I cooked it down a bit to mellow that out. 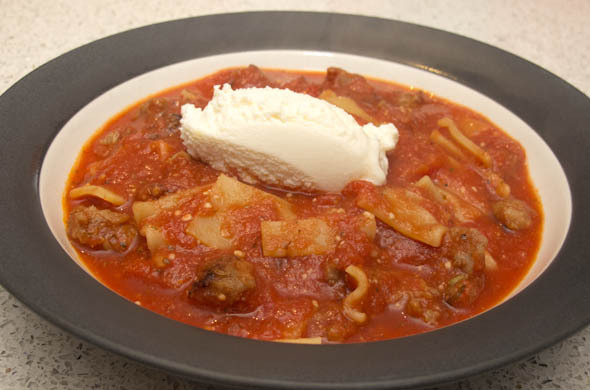 The dollop of ricotta allowed me to gently swirl it around to melt with the meaty bites and the wavy noodles. In a large skillet, remove the casing and cook the sausage over medium heat. Break up the pieces with the back of a wooden spoon. Cook just until cooked through. 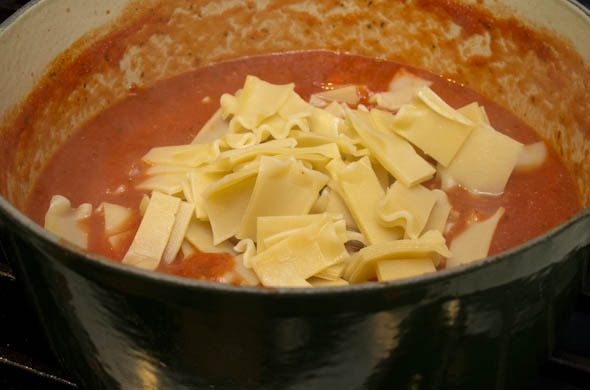 Bring a large pot of salted water to a boil and add in the lasagna noodles. Drain the sausage and add it to a heavy pot with the canned tomatoes, garlic, wine, and Italian seasoning over medium heat. When the pasta is al dente, drain and cut in half lengthwise, then into 1/2 inch pieces (think spoon size). Stir well and reduce heat. 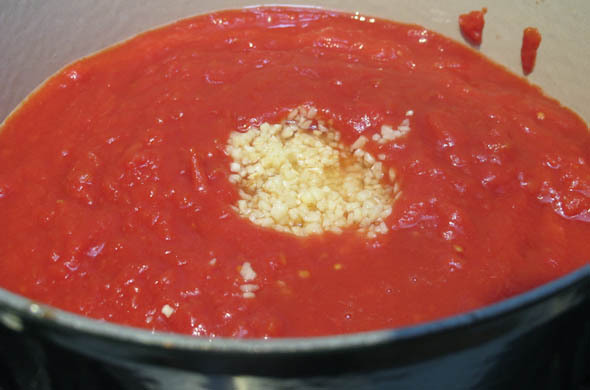 Taste and add salt as needed and Parmesan. Serve with a dollop of ricotta. Enjoy! This is totally the speedy way to have the taste of lasagna without all the steps. I made this just before vacation so I also appreciated not having a lot of leftovers, or filling up the freezer. I have a serious love affair with ricotta so this was right up my ally. I would also try it in individual ramekins with ricotta at the bottom and mozzarella on the top. How fun would those be?! I was thinking about what convenience items are worth the spurge. I especially was thinking about it while trying to get the knife through some butternut squashes. Those suckers are definitely tough to cut so it can be your call if you want to save some dollars and halve the squash yourself, orrrr if you want to pay to get it all skinned and chopped. I cut through them but didn’t peal before roasting. It was super easy to scoop it out once they were cooked. 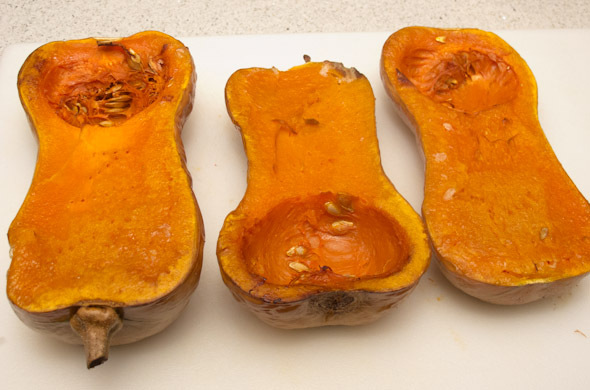 Cut the squash in half and roast for 45-60 minutes. 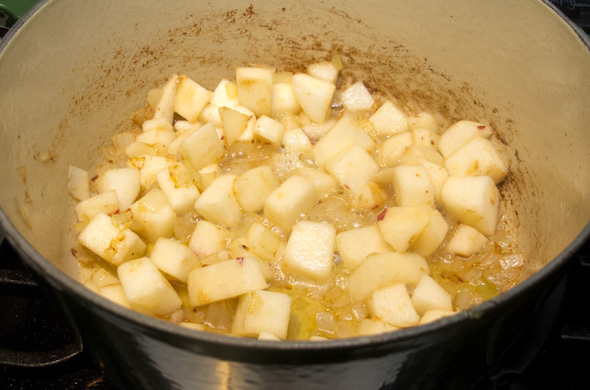 In a large pot, heat to medium high heat and add in the apples and onion with butter. Cook for 10 minutes until the onions are translucent and the apples are soft. The butter will get all bubbly and brown. Scoop out the squash seeds and spoon the squash pulp into the pot with the apples and onion. Add in the stock and cook for 5 minutes or so. 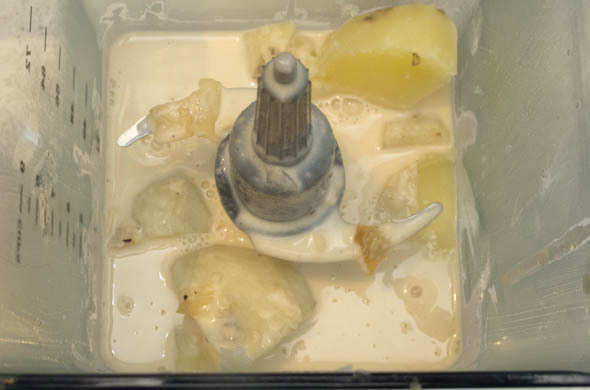 Transfer into a blender or blend with an immersion blender then return to the pot. Season with salt and pepper. 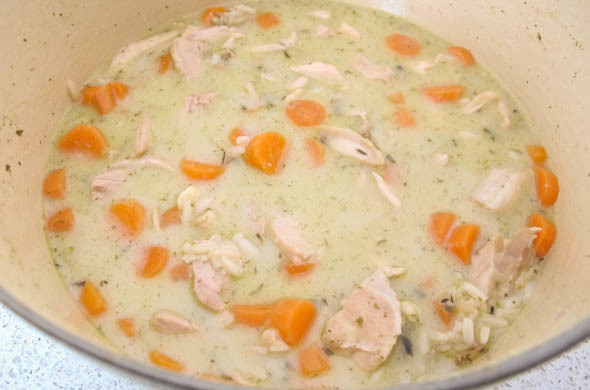 Add more stock if it is too thick for your liking. Add in the cream and stir well. I loved this. It was so good with a touch of sweetness from the apple and I toasted some sourdough for dunking. I froze the rest and will be so glad to pull it out of the freezer some day when I’m not into making dinner. I know, the apples just keep appearing…that’ll be over soon. Bailee oversaw the whole operation. 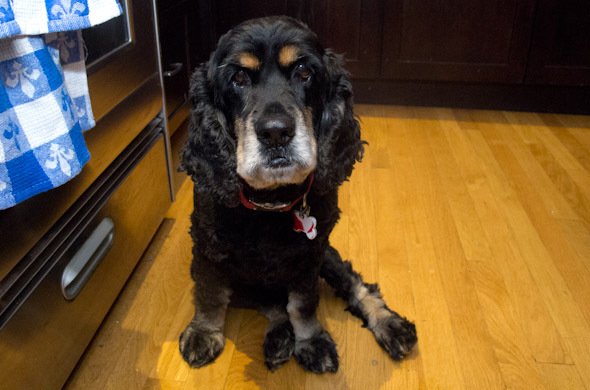 She likes to know what is happening in the kitchen if there’s food around and she wanted to say hi. New England is in that in-between winter and spring time so I have (at least) one more truly wintery meals…don’t hold me to it. 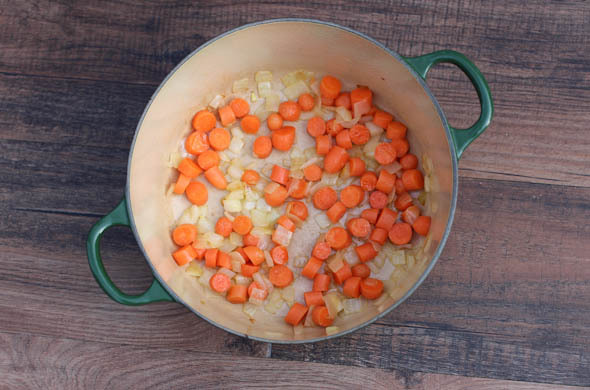 The warm days remind me that spring is coming and the cold days give one last chance to wear a favorite sweater one more time, or to make one more hearty meal. 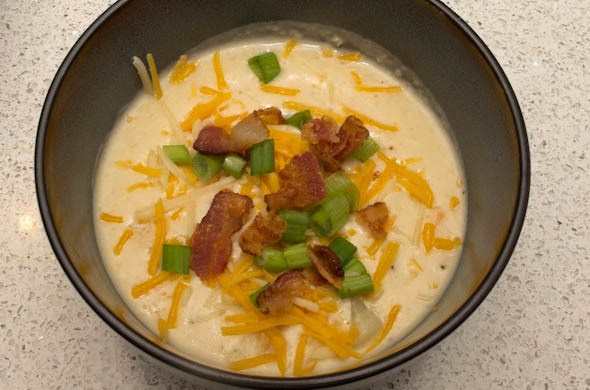 I wanted to do a potato soup and figured I’d mix it up with the “loaded” potato ingredients being toppings. 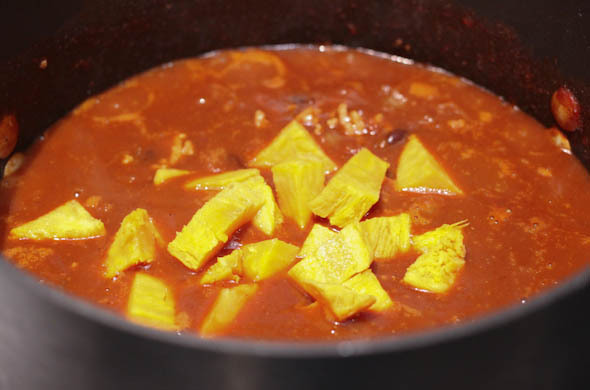 This soup relies on some pureed potato to thicken it. I also thought some sweet potato in there would be fun. Boil or bake the potatoes until cooked through. 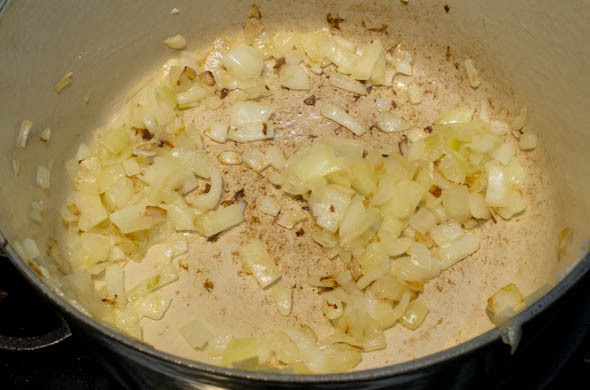 In a heavy pot or dutch oven, cook the onions for about 5 minutes in a little olive oil over medium heat. Cook the onions until translucent and soft. Add the chicken/veggie stock. Be sure so scrape the bottom to mix throughly. Add in the cream and wine, reducing the heat to medium low. When the potatoes are fully cooked, chop them into bite-sized chunks. 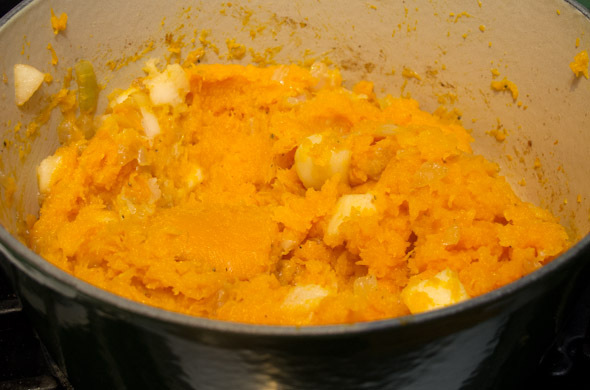 Add half the potato & half the sweet potato into the pot. Add garlic and cook for another 5 minutes. Meanwhile, fry the bacon until crisp in a flat pan. 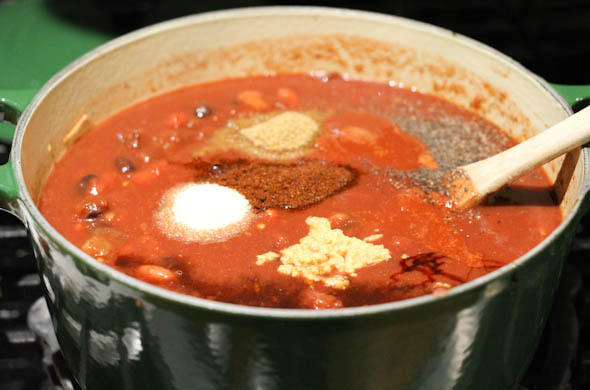 Add a teaspoon of the bacon drippings into the soup pot, discarding the rest. Chop the green onions and grate the cheddar. 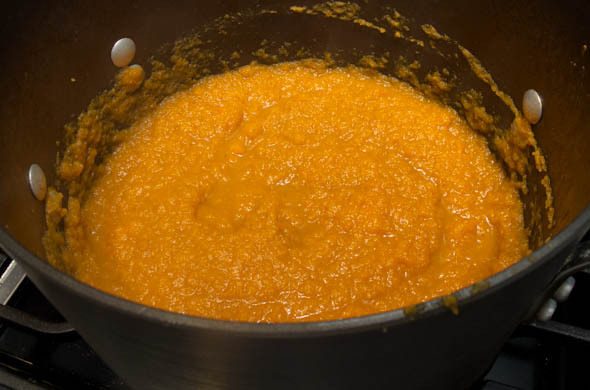 Carefully ladle most of the soup into a blender and blend until smooth. Or, use an immersion blender. Return to the pot, adding the rest of the potatoes & sweet potatoes. Add in garlic powder, thyme, salt, and pepper. Cook for another 5 minutes or so. Add more broth if it is too thick. Top with shredded cheddar, green onions, and bacon! This was really good. 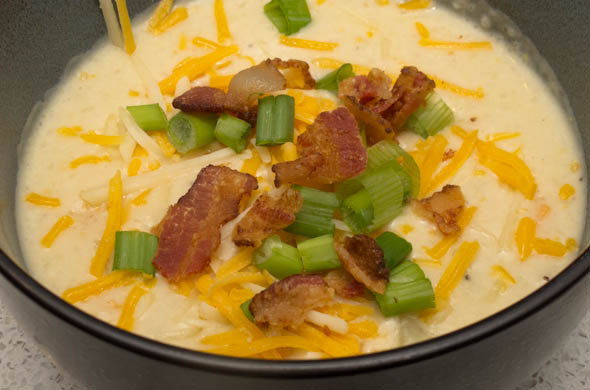 Toppings make everything more exciting to have the cheese, bacon, and onions for toppings instead of cooked within the soup. 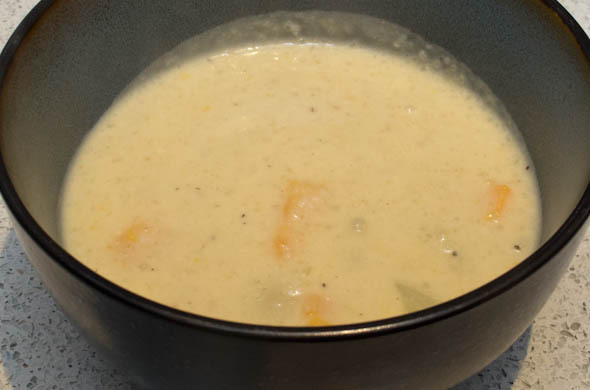 I didn’t blend it all the way but I loved it thickened with the potato, rather than a ton more cream, butter, or anything else. By blending it then adding in more chunks on purpose, you get the best of both worlds! I don’t make soup all the time but this seemed so appropriate on a Sunday night with a pretzel roll to dunk.